Douglas Eddington, president of the board of directors of Lillian Vallely School, stands on the grounds outside the classrooms at the school. Students at Lillian Vallely School receive hands-on instruction in the classroom. The administration at Lillian Vallely School includes, from left, business manager Kathy McDaniel, Principal Jan Eddington, and Douglas Eddington, president of the board of directors. They are standing next to a painting of Lillian Vallely, a Shoshone woman and Episcopal deacon who was instrumental in getting the school started. The sign for the Lillian Vallely sign sits outside the building used by administration, cafeteria, library, and a commons area. FORT HALL — The stated mission of the Lillian Vallely School is to help Native American children in grades K–5, build a bridge to their future success educationally, socially, and spiritually through a quality education consisting of academics, Shoshone/Bannock cultural preservation, and basic Christian values. Its measure of success is to expand a student’s ability to navigate Native and non-Native cultures, to compete academically, and to become a constructive influence at home and in the community. The president of the school’s eight-member board of directors, Douglas Eddington, feels strongly that the school has more than lived up to its mission, and it continues to do so every day. 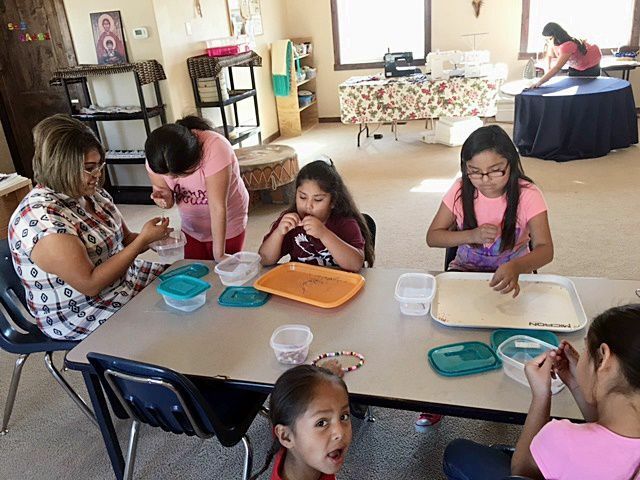 The school is a private non-profit elementary day school serving Native American children who live on the Fort Hall Reservation in southeast Idaho. It was begun in 1997 by then Idaho Episcopal Bishop John Thornton and his wife Jan, at the request of a group of elders led by Lillian Vallely, a Shoshone woman and Episcopal deacon. It’s gone from its start in an old brick building on the Fort Hall Reservation where some of the elders, including Lillian, attended school, moving to a 60-acre farm in 1999 at 350 S. 700 W. on Blackhawk Road, where it presently sits, thanks to a large grant from the Laura Moore Cunningham Foundation, Inc., along with several other gifts. Lillian’s daughter, Colleen Blaylock, is the board secretary. The school has an enrollment of 31 students with an 11:1 student-teacher ratio, which gives it quite an edge in helping students develop at an early age through more individual instruction. Eddington sees the three main components of the school — academics, the students’ native culture, and the basic moral and spiritual values taught at the school — as being essential to the school’s success. Eddington said there’s been time when almost no one in the area knew what was going on at the school. He compared it to the school being like a “doughnut hole.” Over the last two years, leaders have been trying to get the word out. When it comes to the quality of the academic content, Eddington said, students have been scoring above the national average in key areas, he added. The goals include building self-confidence, enabling the students to feel their value. The school has a waiting list to get in, Eddington said. The school may only go up to the fifth grade, but the founders felt it was better to give students a better foundation earlier rather than later, Eddington said. He feels the three main components the school emphasizes have a catalytic effect. Eddington said a lot of people in the area — business leaders included — are starting to go to the school to look around and see how they do things, and they are coming away impressed. Funding for the school has been “nip-and-tuck” since it started, he added, and further help is always needed. Eddington said his own views on providing this type of education to Native children changed with having six adopted Native grandchildren.